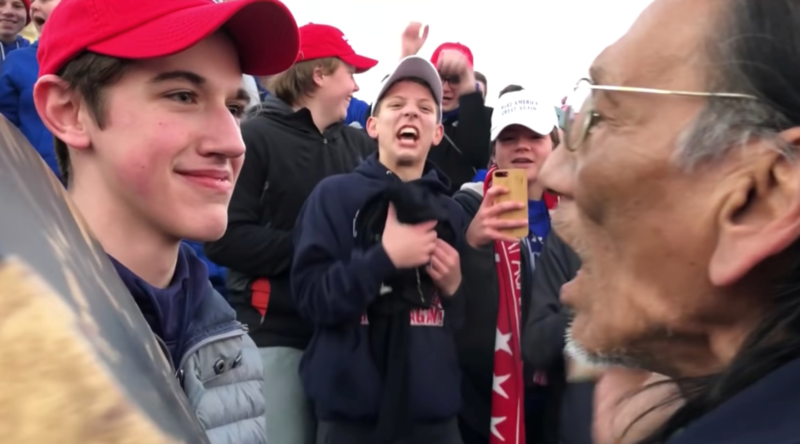 Did A Covert Misinformation Campaign Help Promote Media’s False Covington Narrative? Some tech experts worry the Covington story might have been a well-orchestrated misinformation campaign by internet trolls. Twitter suspended an account some in the media believe was responsible for making the Covington story go viral — but experts worry there were internet trolls pushing the story all along. Twitter suspended an account that was allegedly responsible for stoking most of the drama surrounding the Covington incident, but some experts believe that profile and others are part of a wider effort to sew division. The social media platform removed the account after analysts revealed the profile — @2020fight — posted a caption and a minute-long video of the confrontation between the Covington High School students and American-Indian activists. Data revealed this video appeared to be the primary force driving the conflagration. “This MAGA loser gleefully bothering a Native American protester at the Indigenous Peoples March,” the caption on the video read. The bio attached to the account described the author as a “Teacher & Advocate. Fighting for 2020.” The account tweeted an average of 130 times per day to more than 40,000 followers, CNN reported Tuesday. The original video, which was tweeted out Friday, was viewed at least 2.5 million times and was retweeted roughly 14,400 times. It did not show what happened before the boy’s confrontation with American Indian Nathan Phillips. Media figures and Twitter users called for the boys to be doxxed and shamed, while school administrators said they would consider expulsion. Many of those same people issued apologies after additional video showed a group calling themselves Black Hebrew Israelites accosting the students with profanity and racial slurs before Phillips and others eventually confronted the boys, who said they tried to drown out the two other groups’ insults with school cheers. The footage places the situation into an entirely different context. “In 6-12 months when Facebook and Twitter figure out what Russian accounts are posing as Americans *right now, * you can bet that the Native American / #MAGA teens encounter will be all over it. Stoking both sides,” he wrote in a tweet Monday before publishing the report. O’Sullivan has not yet responded to The Daily Caller News Foundation’s request for comment. Tech researcher Renee DiResta also expressed concern the troll job could be a harbinger for things to come. “Between this and the fake acct pretending to be Nicholas Sandmann that was getting thousands of RTs ginning up the righteous indignation/rage machine, this story is likely to go down as a cautionary tale for media, audiences, and social platforms,” DiResta said in a tweet Monday. She was referring to Nick Sandmann, one of the boys at the center of the Covington controversy. One of DiResta’s projects is New Knowledge, a cybersecurity firm that provided a report in December to the Senate Intelligence Committee that fleshed out to the degree with which Russia used social media to affect the U.S. presidential election in 2016. Russian operatives through a company called the Internet Research Agency spread messages through YouTube, Reddit, Tumblr, Pinterest, Vine and Google+, along with Facebook and Twitter to rile up tensions between Americans prior to that year’s vote. The black community was targeted “extensively with dozens” of Facebook pages and Instagram post, the report notes. Still, there is significant disagreement about the degree with which the ads swayed opinion. Most of the ads did not focus exclusively on then-Republican presidential nominee Donald Trump or then-Democratic presidential candidate Hillary Clinton, and the ad sales amounted to a mere $100,000. It was a paltry sum during a campaign where both sides spent tens of millions of dollars. In an ironic twist, DiResta’s group also reportedly created thousands of Twitter accounts posing as Russian bots to boost Democratic Alabama Sen. Doug Jones’s election year fight against Republican Roy Moore. The phony bots began following Moore’s Twitter account in October 2017 — operatives with NK also allegedly created a slew of Facebook accounts to Alabama voters as well. Analysts argue the campaign was unlikely to have made much of an impact. But the misinformation project attracted attention from local and national media, falsely suggesting Russia was backing Moore’s candidacy. The Montgomery Advertiser, for one, was the first to cover the story using the Russian-bot angle. National media outlets quickly followed suit. Twitter refused to comment specifically about whether a network of phony accounts was driving the bulk of the conversation regarding the Covington quagmire. But the company did tell TheDCNF it believes the @2020fight account originated from inside the U.S., though it is difficult to say for certain.